My name is Charles Niemeyer. I’m known as Chuck, or Commander. I’m from Gastonia, North Carolina. I’m currently working as an Orthopaedic Physician Assistant at Carolina Orthopaedics and Sports Medicine Center. I was a Falling Creek camper for 5 years (1977-78, 1980, 1982-83). 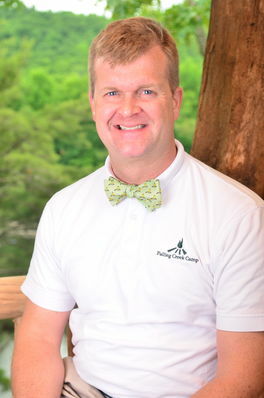 This will be my 14th year on staff at Falling Creek (2006-2019). My favorite camp tradition at Falling Creek is being around a great and talented group of young men and women, seeing all of the campers get to have the same experiences that I did so long ago. The best advice I’ve ever been given was get plenty of rest, eat smart, and keep your feet clean and dry. If I had to sing karaoke, I would sing “YYZ” by Rush (an instrumental, of course!). The hardest thing I’ve ever done was saying farewell to my family before a long military deployment.